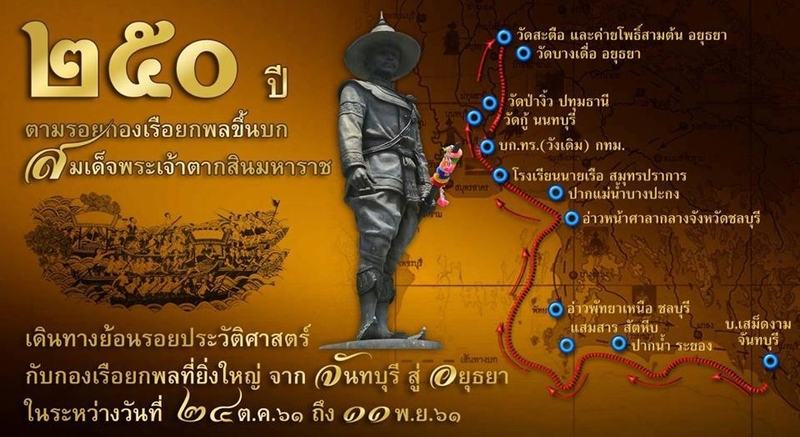 All are invited to join the event of “250 Years: Amphibious Squadron: King Taksin the Great From Chantaburi to Ayutthaya” organized by the Royal Thai Navy between 24 October to 11 November 2018 to trace back the significance of Thai history with activities including a tribute to King Taksin the Great who survived the nation. Activities will be held in many provinces at which the ship will stop by such as Chantaburi, Rayong, Chonburi, Chachoengsao, Samutprakarn, Bangkok, Nonthaburi and Ayutthaya. For more information, please contact King Taksin the Great Foundation.